The introduction, for the benefit of the participants, at the Historic Houses of Romania walking tour in west Cotroceni area of Bucharest, the 21 May 2017 edition. Bellow is a fascinating cubist-like design embellishing a wrought iron gate structure, which I encountered in Cotroceni quarter of Bucharest and have also shown to the participants at my architectural history tour, which took place in June past. It is another testimonial of the effervescent creative years of Bucharest that span the inter-war period, considered as a golden age for this city. The gate is in a run down state and needs urgent caring attention, but I doubt that it would ever receive any attention from the contemporary Bucharest people, having in fact a much higher chance to reach the scrapyard and be replaced by a new and “beautiful”, in their uncouth eyes, production line gate from a DIY shop. Yesterday I organised the first from my planed series of architectural photography tours in Bucharest and nearby towns. The area scheduled for exploration was Cotroceni historic quarter in west-central Bucharest. The participants were very keen to find out all matters of architectural and social history peculiar to this area of Romania’s capital and how to perfect their architectural photography skills using point and shoot cameras. I have been pleased to be their guide and trust that my explanations, pointing out particular details, advising about basic architectural photography techniques and making sense of a complex and apparently chaotic historic architectural landscape were well received by the participants. 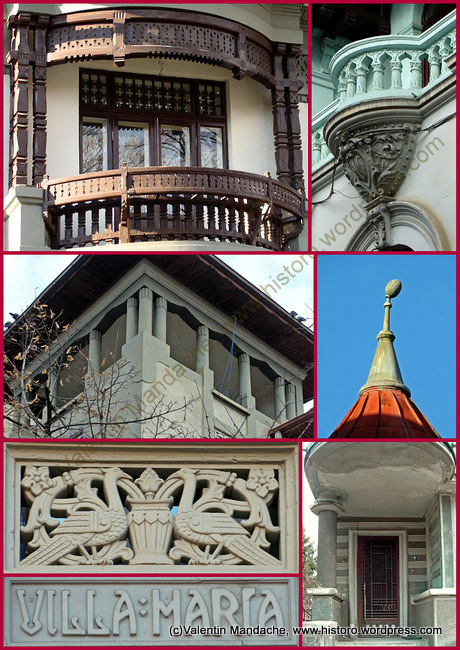 A sample of the exquisite architectural images shot yesterday in Cotroceni is presented in the above collage. The quarter boasts mainly Neo-Romanian and Art Deco style residential architecture and is one of the best preserved built heritage areas of Bucharest. The next Sunday (12 June ’11, 9am-12.00) architectural photography tour will take place in Mantuleasa historic quarter, east central Bucharest; meeting point: University subway passage, in front of Bucharest Tourist Information booth. I look forward to seeing you there and go exploring this more than fascinating city corner! There is a classical theme discernible in the design of the doorway assembly presented above, namely that of the Ionic order. That can be seen in the fluting (vertical grooves) of the door’s two side columns, feature also suggested by the vertical bars forming the gridiron of the door window, which is poignantly crowned by Ionic order capital motifs (the ram’s horn). I like the way how the 1930s architect adapted with great ease these classical elements to the Art Deco design scheme, without even a hint of dissonance between the ancient and modern patterns. Even the “S” shaped door handle participates to that wonderful play of proportions and contours.